So you think you don’t like reading about history? Pick up a copy of TOP SECRET FILES: THE CIVIL WAR by Stephanie Bearce, and be prepared to change your mind! 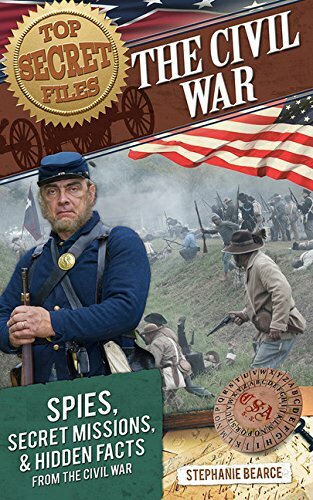 In these true stories, you’ll read about the failed assassination attempt on President Lincoln, the nurse who dressed like a man in order to become a Civil War spy, and the Confederate’s capture of an empty fort. No computers in the 1800’s? No phones? No problem! Find out how secret messages were sent using spy fans, eggs and secret codes. Then try out your own spy skills with the activities provided throughout the book. Find out how men, women, slaves and even young boys worked together for a cause that they believed in, using their skills and creativity. Once again, Stephanie Bearce’s quick-paced writing, along with the illustrations and photographs, will draw readers in and make a fan of even the most reluctant history reader. Another excellent read for students as well as adults who want to know more than just dates and dry facts.